What's Next: The US-China Long Game: Some of the brightest minds I talk to in tech believe we are headed toward a bipolar future where the United States and China close their tech markets to one another and fight for conquest of the rest of the world, like a game of Risk. There will be an American and a Chinese version of everything -- an Amazon and an Alibaba; a Google and a Baidu; an Uber and a Didi Chuxing -- and each pair will compete for rights to Asia, Africa, Latin America and Europe. 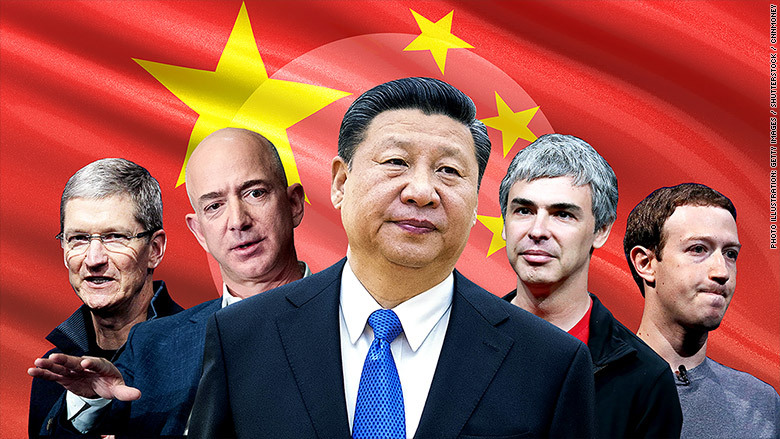 The Big Picture: Tech dominance will be how the US and China establish political and economic influence over the rest of the world. The lines of the new geopolitical map will be drawn by tech companies, on a country-by-country basis. Longstanding political and military alliances will shift due to new economic considerations. Good morning. The US-China trade talks have ended without a deal. In the last 10 days we've met with lawmakers in Washington, business leaders in Beverly Hills and VCs and tech executives in New Orleans. Guess what they all want to talk about? China. China. China. China. The issue is also likely to be a key focus at Warren Buffett's annual Berkshire Hathaway shareholders summit in Omaha this weekend. China's rise as a technological power is, to me, the most important story of our time. As General David Petraeus said earlier this week at the Milken Global Conference, "There's a new dialectic, a new competition of ideas." "Our political model is being contested," said Tony Blair, on stage with Petraeus. "We have to understand our position in the world is going to be challenged not just economically but politically." President Trump's effort to slow China's technological rise, including the threat of an executive order that would ban Huawei and ZTE from the US, has only emboldened China's support of its tech and telecom firms. • "President Xi Jinping has responded ... by vowing to pour even more resources into research and achieve home-grown breakthroughs. He urged China last week to "cast aside illusions" it could rely on others for help." • During the trade talks, the US delegation asked China to stop subsidizing its technology companies. "The hosts said their technological advancement goal isn't on the table." • "'The more pressure the U.S. puts on China, the more urgently the country has to develop its own high-tech products to reduce reliance on the U.S.,' said Xu Jianwei, a senior economist for greater China at Natixis SA in Hong Kong." The Big Picture: China is committed to a $300 billion Made in China 2025 development plan that would make it a global leader in ten categories, including robotics, biotech and aerospace. It is also committed to becoming "the world's premier artificial intelligence innovation center" by 2030. US threats are highly unlikely to curb those ambitions. What's Next: "Investors are preparing for a blockbuster year of Chinese tech IPOs," per CNNMoney's Sherisse Pham: "Smartphone maker Xiaomi filed this week to go public in Hong Kong ... It is one of several major Chinese tech companies that could make their stock exchange debuts this year." So... how 'bout those trade talks? NYT's Keith Bradsher in Beijing: "Senior Chinese and American officials concluded two days of negotiations late Friday afternoon with no deal and no date set for further talks ..."
• "Chinese negotiators asked the U.S. side to listen to ZTE's appeal, take into account the company's efforts to improve its compliance and amend the ban." • "China's Ministry of Commerce said ... U.S. officials, for their part, said they "attach importance to China's representations and will report China's stance to the U.S. president.'" • "China would likely respond with a strong reprisal against U.S. companies operating on the mainland." • "Resulting government actions and reactions could escalate to the point where irreparable damage is done to relations between the two countries." • "China's economic future is widely thought to depend on its technology sector -- and it will not stand idly by as the U.S. decimates some of its most important firms." Elon Musk is defending his bizarre performance on this week's Tesla earnings call that caused the company's stock to plummet 5% yesterday. • "First, it's important to know that Tesla is the most shorted (meaning most bet against) stock on the market & has been for a while." • "2 questioners I ignored on the Q1 call" -- he blasted one for asking a "boring, bonehead question" -- "are sell-side analysts who represent a short seller thesis, not investors." • Musk said the question was boneheaded because it "had already been answered in the headline of the Q1 newsletter he received beforehand, along with details in the body of the letter." Why back down when you can double down? Tesla stock? More or less stable, as of 8am PT. Bonus: Kanye West's latest tweet: "I can't wait for electric planes. Elon please hurry up with the jets." • "By holding up a smartphone toward the 80-foot long double-sided LCD screen on stage, fans will see superimposed images and videos meant to enhance the experience." • "'I am abusing technology, if you like,' Bono said ... '[What we're] using goes back to the very early stages of U2 when we would stage dive to break the fourth wall, trying to reach our audience and touch them.'" The Big Picture: AR, VR and other technologies have the potential to radically alter the live entertainment experience, not just in music but in film, theater, sports, etc. U2 has long been an innovator in that space. Bonus: I spoke to Wyclef Jean, Major Lazer's Christopher Leacock and Combs Enterprises' Dia Simms at Collision about the future of music and technology, from both a business and a creative perspective. Leacock has the full video on his Facebook page. • "The company announced several content pacts. It's renewing three deals out of the seven ad-supported original shows it announced last year," including deals with Kevin Hart, Demi Lovato and The Slow Mo Guys. • "YouTube is working with actor Will Smith" and will live stream his "bungee-jump from a helicopter over the Grand Canyon for a charity fundraising event." It also announced new deals with LeBron James, Priyanka Chopra and Jack Whitehall. • "YouTube has renewed its exclusive live-streaming deal with the Coachella music festival for an additional three years." • "Apple has become so serious about competing with Facebook, Google/YouTube and Twitter as a distribution outlet for news publishers that it's paying publishers to unveil shows on Apple News first." • "Last month, BuzzFeed News premiered "Future History: 1968," a documentary series ... BuzzFeed News released the first three episodes exclusively on Apple News, a week before uploading them to Facebook Watch, YouTube, Twitter and its own mobile app." The Big Picture: Content is king. What Next: The Kentucky Derby. Saturday at 3:46 p.m. PT on NBC. Amazon is backing a horse named Audible. At 7-1 odds, he's one of the favorites. My colleague Paul R. LaMonica explains. See you Monday, from L.A.